The Soil Diagnostic Kit (MTT), developed by MecoConcept, is a small, mobile laboratory that allows you to analyse soil anywhere. All you need is a simple table. Because of its diverse character, it is essential to accurately analyze the soil you wish to use in construction. For simple tasks (wall inertia, filling), a simple soil diagnosis may be enough. The MTT has two patents pending. What is in a Soil Diagnostic Kit? It contains all the tools and accessories needed to complete a soil diagnosis and allows you to you know whether or not the soil is suitable for manufacturing Meco’briqs. The procedure and all instruments are described in a detailed booklet that comes with the kit. Soil chip breaker : apparatus to measure the clay content and the mold were developed and patented by Meco’concept. Software, a direct result of Meco’concept’s scientific research, which interprets various test results. USB key with software and charts for the diagnosis. Measuring instruments: precision pocket scale 320g, 15 cm calipers. Containers and utensils : bowls, jars, spray, trowel, and shovel. Would you like a more complete analysis? 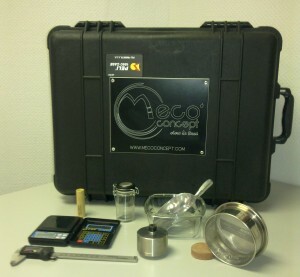 MecoConcept provides soil diagnositcs and complete soil analysis in our lab. For more information, please contact us or download our technical document.